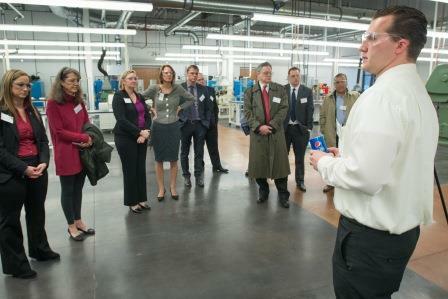 AkzoNobel has opened a new $10 million research, development and innovation facility in Ohio. The Amsterdam-based paints and coatings company celebrated the opening of the center Tuesday (Dec. 1) in Strongsville, OH, with ceremonies that included local and state representatives as well as corporate leadership. The new facility will serve the company's North American Performance Coatings businesses, which includes coil, extrusion and packaging coatings. AkzoNobel celebrated the opening of its new research, development and innovation (RD&I) center Tuesday (Dec. 1) in Strongsville, OH. Featuring full testing, scale-up and analytical capabilities, it will house more than 120 staff, including 65 highly trained scientists and technicians, according to the company. 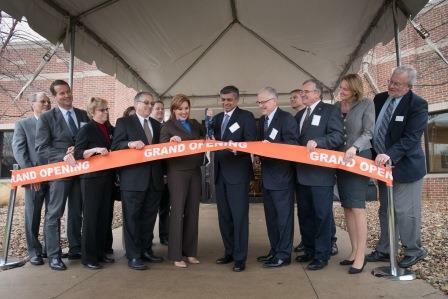 Following the ribbon-cutting ceremony that officially opened the facility, a number of notables were on hand to welcome the facility to the Strongsville community, including Armond Budish, County Executive for Cuyahoga County; Bernadine van Kassel, Director International Business Attraction for Team NEO [Northeast Ohio]; and Ohio Lieutenant Governor Mary Taylor, among others. He sees the new LEED-certified RD&I center as a model for what future buildings in his city should aspire to. All speakers commended the cooperation between the company and state and local representatives that made the new facility possible. Each also welcomed the company’s investment in the people of Ohio, taking advantage of their work ethic and skills, by bringing jobs to and making a capital commitment to the area. Featuring full testing, scale-up and analytical capabilities, the facility will house more than 120 staff, including 65 trained scientists and technicians. Peter de la Porte, Honorary Consul from the Kingdom of The Netherlands, closed the VIP remarks by delivering a proclamation officially recognizing the working partnership between the U.S. and The Netherlands. The RD&I center represents a $10 million investment in AkzoNobel’s North American Performance Coatings businesses. “By expanding our facility in Strongsville, we are providing a central, state-of-the-art technical resource for our businesses in North America, creating the critical mass for effective RD&I to more efficiently support our customers,” AB Ghosh, managing director of AkzoNobel's Metal Coatings business, said of the opening. "The facility will also enable us to focus on further improving the performance and sustainability of our products," he added. 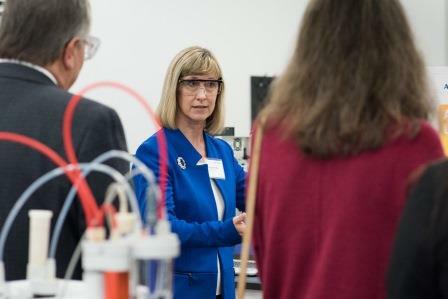 The event included a tour of the labs located in the RD&I center, as well as the building controls center that maintains the green building operations and a look at the technically advanced, secure warehouse and storeroom. The facility provides a modern, open-plan laboratory environment housing industry-leading research, development and innovation activities for the company’s metal coil, extrusion and packaging coatings customers. The first LEED-certified building in the city, the facility provides a modern, open-plan laboratory environment housing industry-leading research, development and innovation activities for the company’s metal coil, extrusion and packaging coatings customers. As Ghosh mentioned in his opening remarks, the open environment is intended to promote collaboration among staff. Ground was broken for the facility in February, with much of the staff moving into the building in September. The Strongsville center is the latest in a series of investments to strengthen AkzoNobel's research capabilities in the region. The company recently announced that it is investing around €3 million ($3.4 million) to expand its RD&I capabilities in Houston, TX. The Houston facility will support the company's Protective Coatings, Marine Coatings and Specialty Coatings businesses. Of the Strongsville center, Klaas Kruithof, Performance Coatings RD&I director, said, "This is a significant investment which underlines our focus on technology and product innovation, as well as our commitment to the North American market. “It will be an integral part of our global RD&I function and will directly contribute to our overall growth plans." AkzoNobel is a global paints and coatings company and a major producer of specialty chemicals. It staffs approximately 46,000 people in around 80 countries and about 200 production sites. Approximately 45 production sites and 14 R&D centers are located in North America. Its portfolio includes brands such as Dulux, Sikkens, International, Interpon and Eka.